Conservative talk show host, Michael Savage, who fervently supported Trump during the Presidential campaign, soured on him today. Savage, referencing his background in science, having a PhD in epidemiology, said the alleged gas attack in the ISIS controlled city of Idlib was most likely phosgene and not sarin. Backing up his claim that the attack did not contain sarin, Savage made reference to photos showing first responders attending to bodies without gloves or protective gear. 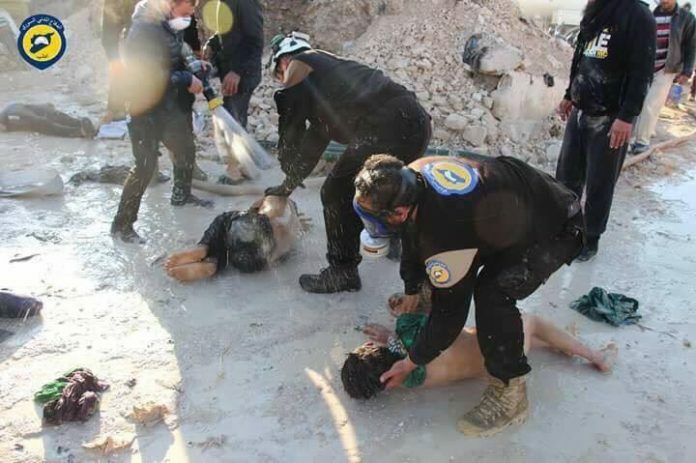 Had sarin been used in the attack, all of those men in white helmets would be dead. In nearly a 15 minute soliloquy over the attack, Savage lamented that the neocon 'military tweet' by Trump was a ploy to increase his popularity, in light of falling poll numbers. Verbosely, Savage hemmed and hawed with disappointment, dispirited that he spent over a year advocating for Trump, who said he eschewed the interventionist policies of people like McCain, Graham, and Schumer, only to cave in shortly after winning the Presidency. Savage also questioned the timing of Jared Kushner's trip to Iraq, coupled with Bannon's timely demotion from the NSC -- just ahead of the attacks as being highly suspicious. "This whole thing stinks to high heaven,' said Savage. Furthering his criticism of the President, Savage proclaimed: "It looks like Hillary, deep state won, and Trump is doing her bidding." As it pertained to who was responsible for the attack, Savage reminded his audience that just last week Putin was considered to be the smartest and most diabolical man on earth. If so, why on earth would he permit Assad to launch a chemical weapons attack, when they had already defeated the rebels, which was sure to turn public opinion against them? "Why would he do it, you morons you? ", said Savage. Who are we supporting? According to Lindsey Graham, the 'free Syrian army.' Savage exploded: "The free Syrian Army? There is no such thing. The free Syrian Army are our moderate terrorists created by the CIA and John McCain. John McCain and Lindsey Graham are the mouthpieces for this army of murderers." "The west jumped to a conclusion, before there was any investigation." A must listen to a voice of reason.